Time for a cushion delivery! We need to pop down to Poole with a cushion for the Mission to Seafarers, Bournemouth and then onto Wool with one for Cancer Research UK, before taking a sneaky peak at the cygnets at Abbotsbury! More deliveries during the week…..now, which ones to take today? I know, I’ve gone a little overboard with puppies, but I just love them! Oh, the total is 92 cushions! I forgot to add the West Wight Sports Centre, who have lost their council funding and are desperate for help! The final cushion has been requested! Requested by the Southampton and New Forest MG Owners Club who gave a New Forest run and fund raising event in June, the funds are split between the Society of St James, who care for the homeless and those suffering from alcohol and drug dependency (I’m so pleased to be supporting them, there are too many folk struggling like this) and Brendoncare (they looked after my Dad for the last two weeks of his life last year and of course they’ve had a cushion already, but I owe them so much, they were truly fabulous in his care). Cancer a Research Uk, Childsplay Romania, All Saints Gurnard and Bournemouth Mission for Seafarers. I’m off to do some sewing! Last chance for a cushion! My “60 Cushion Challenge” year ends on Friday, 4th April. 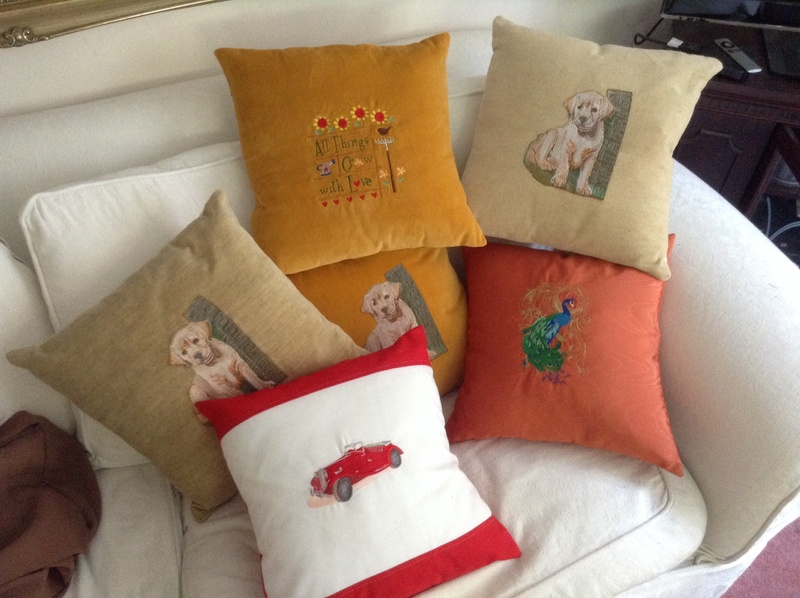 I’ve made 80 cushions, have requests for three more. Of the 80 cushions delivered, I know of 58 auctioned and raffled. They’ve added approximately £6,480.50p, to the coffers of local charities, which is an average of £111. My spreadsheet tells me those delivered and requested have a potential to make £9,256! I am in awe of those of you who work tirelessly for the charities that you support, and one of my joys this last year has been meeting so many of you. 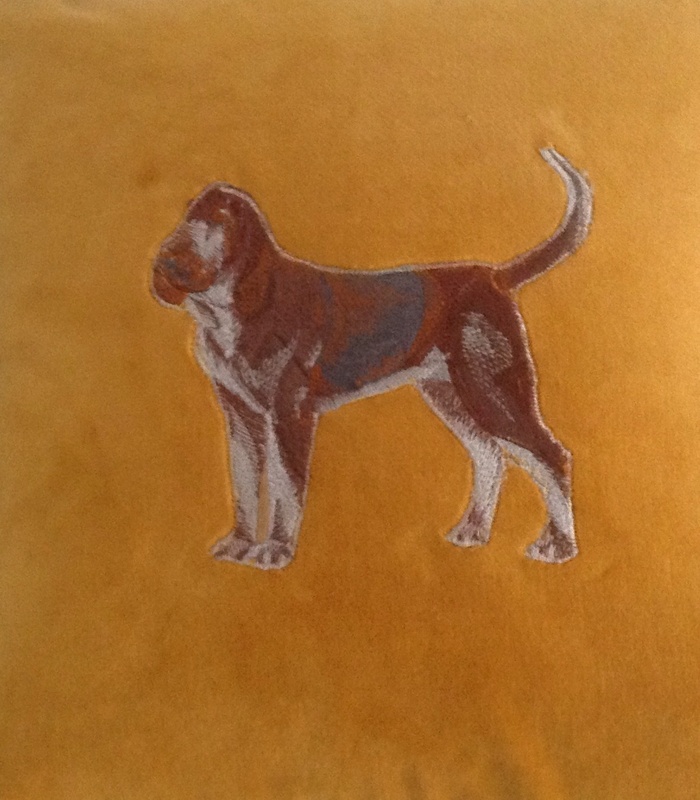 To try and make sure the amount tops £10,000, I’ll take orders for cushions until midnight on Monday, 7th April. Fingers crossed they won’t all be needed for the same date! If you ask for one, all I ask us you make as much as you possibly can! Amazingly, cushions have been auctioned for between £45 and £500! Raffles vary from £10 to over £400! Fingers crossed! Go apply for one for your charity in Dorset, Hampshire or the Isle of Wight. I delivered cushion number 80 to Hythe this afternoon, and as usual when I meet anyone asking for a cushion, was struck by the energy and optimism of fund raisers and supporters. 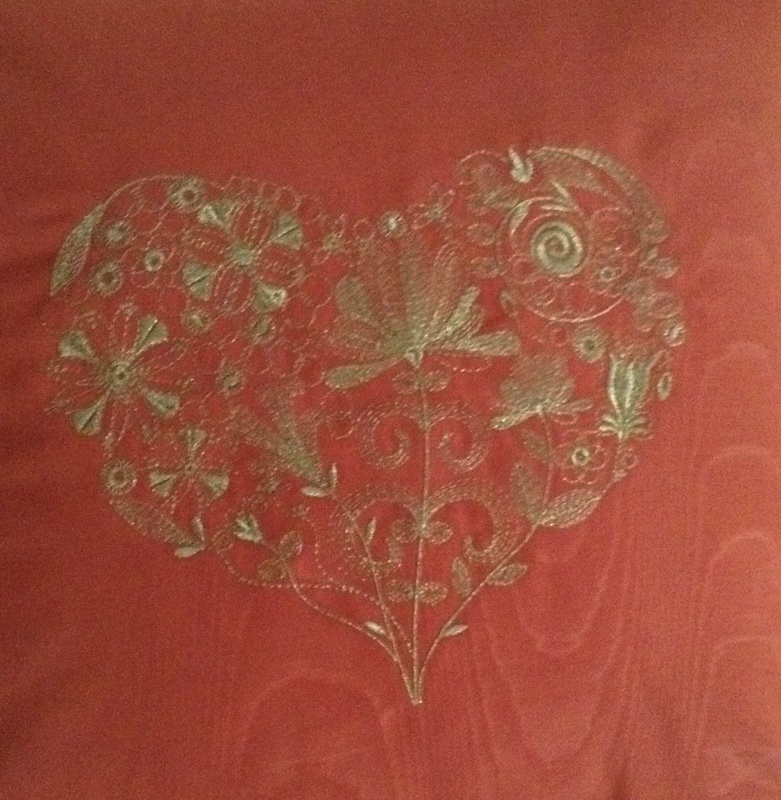 The cushion will start to be raffled at their Easter Fayre at St John’s Church Hall in Hythe on April 5th, 10.00 am – 2.00pm, with a children’s Easter Bonnet parade at 1.00pm. Tickets for the cushion will continue to be raffled until their Summer Ball, later in the year. 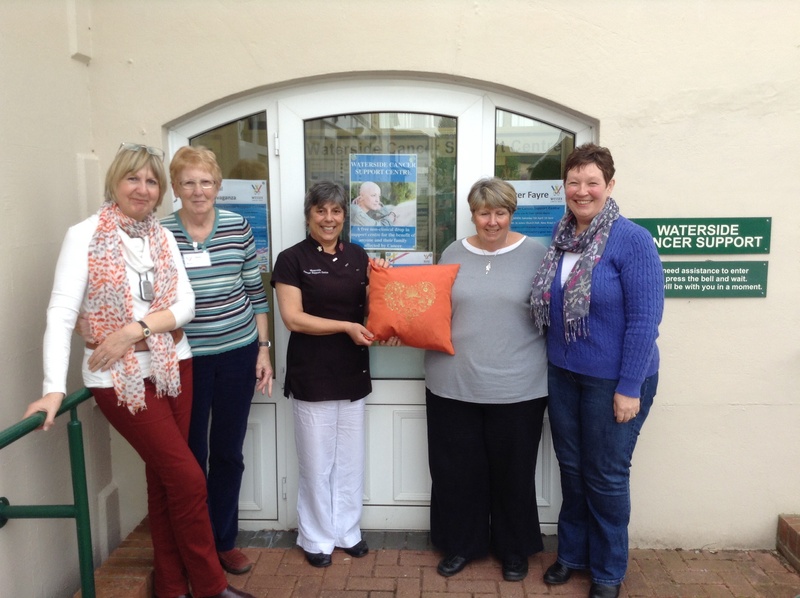 Here are Meg, Sheila, Jude, Michelle and Jaqui, befrienders, therapist, and cancer survivor who finds the Centre a very special place. This Saturday, April 5th, there’s an Easter Fayre at St Johns Hall, Hythe, near Southampton, to help raise funds for Waterside Cancer Support. Please pop in, enjoy the Fayre, and buy a raffle ticket! I love this heart design, I’ve made several over the last 12 months, I think it represents the warmth, love and support that so many amazing people offer the world.